Hadamard Matrix Analysis and Synthesis: With Applications to Communications and Signal/Image Processing presents the basic concepts of Sylvester's construction of Hadamard matrices, the eigenvalue-eigenvector decompositions, along with its relationship to Fourier transforms. Relevant computational structures are included for those interested in implementing the Hadamard transform. The 2-dimensional Hadamard transform is discussed in terms of a 1- dimensional transform. The applications presented touch on statistics, error correction coding theory, communications signaling, Boolean function analysis and synthesis, image processing, sequence theory (maximal length binary sequences, composite sequences, and Thue-Morse sequences) and signal representation. An interesting application of the Hadamard transform to images is the Naturalness Preserving Transform (NPT), which is presented. The NPT provides a way to encode an image that can be reconstructed when it is transmitted through a noisy or an unfriendly channel. The potential applications of the Hadamard transform are wide and the book samples many of the important concepts among a vast field of applications of the transform. 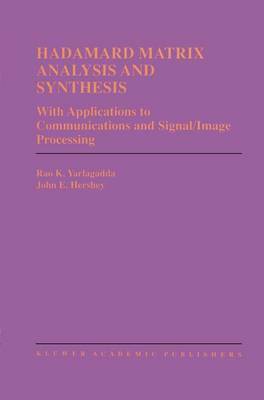 Hadamard Matrix Analysis and Synthesis: With Applications to Communications and Signal/Image Processing serves as an excellent reference source and may be used as a text for advanced courses on the topic.